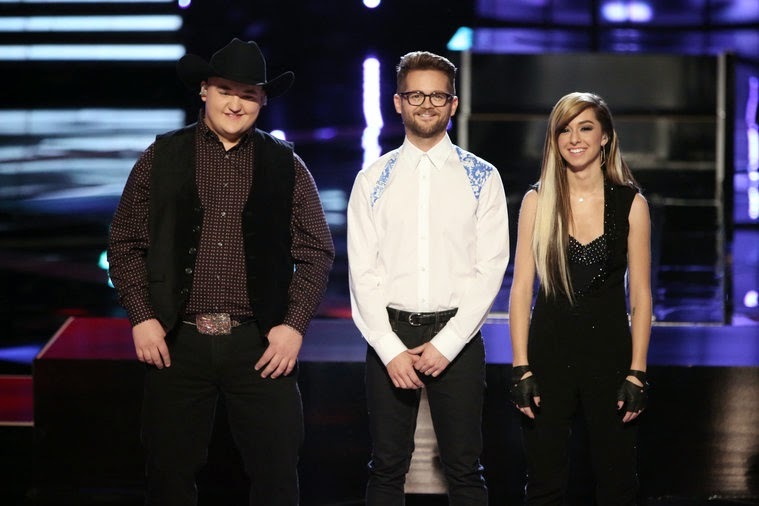 That's Just My Thoughts: Who Will Win “The Voice” Season 6? It really was a battle of second chances. Jake auditioned for season five and didn't have any chairs turn. He came back and showed the coaches and us that he does deserve do be there by turning three chairs. Josh was doing great until Adam gave Delvin the win in the second round of Battles... fortunately, Usher stole Josh and a remarkable partnership was created. Christina was always a front runner until a song choice landed her in the Bottom 3. Thankfully, she was saved by the Instant-Save and also moved on to the finals. 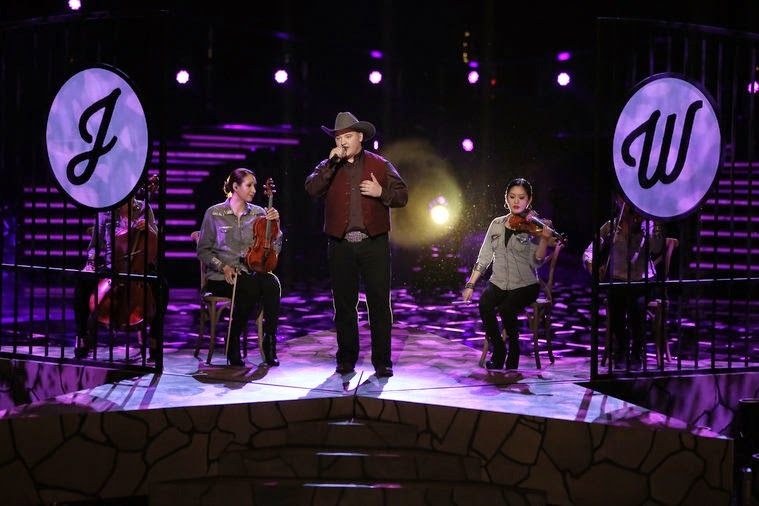 Each artist performed three songs last night—an encore performance from this season (voted on by America), a new song, and a duet with the respective coach. On the technical, vocal, or performance aspect of each artist, there really isn't much to say that hasn't been said by me or other reviewers multiple times. Last night can be summed up in one sentence... each artist performed flawlessly and were amazing on every level. Christina opened with the fan voted encore performance of “Wrecking Ball.” I think she is the most entertaining and engaging 'performer' of the Top 3. When she's on stage, she looks amazing, confident, and comfortable. Her expressions and movements match the 'story' of the song every time, and it's always like I'm watching her concert, rather than a competition. The duet she did with Adam was remarkable. Her personality shone brightly alongside Adam, and both their voices seemed to blend into one amazing tone. The feelings portrayed through the lyrics were powerful, and I think this was the best she's ever sounded. For her final song, Christina chose to take another risk and do Elvis' “Can't Help Falling In Love.” If you're going to cover the king of Rock 'n Roll, you better nail it... and she did. For the first few bars, she sang A Capella, and it was simply beautiful. For the rest of the song, she showed off her incredible range and control, added the 'Grimmie' touch, and just blew it out-of-the-park. Josh showed his great personality and energy with his voted encore of “Signed, Sealed, Delivered, I'm Yours.” Josh had fun. The audience had fun, and even though this isn't one of my favorite genres, I can't deny how exceptionally well he delivered it (pun intended). His duet with Usher was amazing, and like the other coaches and their artists, their two voices blended very well together. The only thing I would have like is if Josh had dressed down a little to match Usher's t-shirt and jeans. Josh closed the show with “Set Fire To The Rain.” The stage setup and wardrobe matched nicely with the song. His tone and delivery was very impressive, and I think this was my favorite performance of his so far this season—even Usher was on his feet before Josh had even finished singing. It was a great way to close out the finale. Jake's fans voted “Don't Close Your Eyes” as his encore performance. With Jake, you always feel the sincerity and humbleness of his personality come out with every song, and this one was no different. It definitely had the Grand Ole Opry feel, while he sat there with his guitar and a single violinist beside him. My only thing with Jake is his occasional fault when he's singing in the low register, but it doesn't matter... he is purely and incredibly a talented country singer. Regardless of what happens on The Voice, he will have a huge career in Nashville. Jake's duet with Blake was worthy of the Grand Ole Opry. Their voices and tones matched and harmonized as though they were of one voice. Jake seemed so comfortable singing alongside Blake that it came across as though they have been doing this forever. I have to say that Blake seemed much more comfortable singing with Jake than he did with Shakira (they performed “Medicine” last night). With Shakira, Blake seemed like the awkward boy trying to talk to the hot girl. Anyway, Jake's last song was his take on Richard Marx's “Right Here Waiting.” Jake has this uncanny ability to re-invent songs to suit him, and every time it works amazingly well. There were some spots where I think he was nervous and missed the pitch, but the coaches said they loved his 'nuances.' While that may have been it, I did see Jake's expression change when I thought he missed his 'mark.' I took that as he knew he did 'lose his tone' for a second, but I could be wrong... maybe those 'misses' were intentional. Either way, it never actually took away from his great vocals. It was another pure, heartfelt, and connected performance, and I will be there to buy his first album. This season has been incredible. The talent was off-the-charts, and the energy in every performance was intoxicating. In my opinion, Christina, Jake, and Josh are all equal in talent and performance ability. They are three very different artists in style but equally deserving of the win. I have noticed, this season's Final 3 have attracted some big name stars to count among their fans. Kelly Clarkson is really fond of Jake. Watching @NBCTheVoice and I miss this kind of country music. Keith Whitley, so awesome. Good job Jake! If some idiot record executive comes in and ruins the old school vibe that @JDW_Music has then I'm gonna have slap somebody ....that's all. Selena Gomez has come to really like Christina. Justin Bieber has shown great support for Josh. 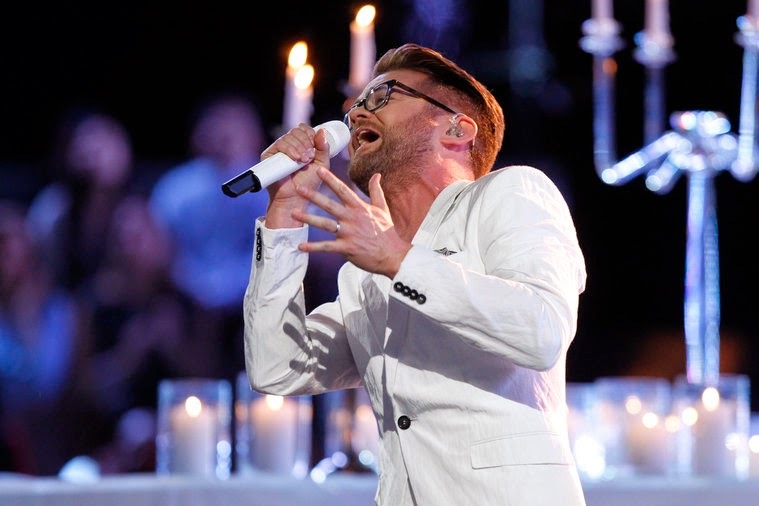 Vote #TeamUsher and @iamjoshkaufman - http://t.co/CVasIMjYDK and Call (855) VOICE-03 and Text 3 to 8642 pic.twitter.com/r7aJ0FbpES let's go! I'm not going to predict a winner per say, because I think they have already all won. I will predict the way I think the outcome will be tonight, though. Honestly, it doesn't really matter who 'wins' tonight, because it's more than probable that the moment the other two walk out of The Voice studios for the last time, they will be met by a record label... contract in hand. Jake picked up great momentum and his fan base has grown exponentially these past couple weeks, but I think that great voice and talent may have been noticed a little late in the game. Because of that, I place him in third. Josh and Christina have both had ups and downs but have been pretty equal for most of the season. If it wasn't statistically impossible (based on the sheer number of votes being cast), I would say they would likely tie for the win, but that's not going to happen. So, for my prediction, and by the smallest margin ever, I give the win to Christina Grimmie. Tune into NBC tonight to find out who will be "The Voice"